If you follow me on Twitter you will know I have been away for a week or so and in doing so, neglected my blog. I think i am going to have a little re-think on my blog, nothing major i just feel like i need to pour more of ‘me’ in to it again. Nevertheless, this isn’t want this post is about, this post is a review and i am so excited in doing it. Initially i was kind of happy and kind of annoyed (forever the decision making, brave lion hearted woman) . I had been in another store poking a brush head on another facial brush until i decided it was too soft, when i found this one it was all wrapped up in plastic so i was unable to poke and prod around. Of course i was happy ( in a way) because it meant nobody else could of poked my new brush, but i did kind wanna know what it felt like before i paid for it. Once i got it out of the packaging i was pleased to find the bristles were firm and the massaging side was softer but still firm enough to feel like you were actually doing something to your face. I’ve been using it alone with some simple oil balancing facial scrub (that’s a whole other story) for a week or so now and sorry to give in so soon but i have been absolutely loving it. It has made the BIGGEST difference to my skin and it is probably my favourite purchase of 2016 ( and no that’s not cheating because it’s almost 2017). The small head makes it easy to get in to every nook and cranny of my face and the pink massaging side makes it really love to finish with. I noticed some people complaining about the size of the brush head but i found it really useful. It doesn’t soak up uneccesary product and helps me to avoid the sensitive areas around my eyes. Below I will get in to what i didn’t like about the bristles but for now i do have to comment on the fact that i personally loved how firm they were, i love stuff that really scrubs my skin and these bristles don’t mess around. I wasn’t overly keen on the price. For a face brush that i didn’t even know anything about, it did feel a little steep but now I have tried and tested it, it really is something i would buy and pay for again. As much as i loved the bristles, some people seem to really dislike them. I don’t have overly sensitive skin so i am enjoying really scrubbing around my T-zone and chin but people that do suffer from sensitive skin probably should avoid this face brush. The bristles are firm and quite hard and although they are flexible and bend to your face, they do really exfoliate the areas you scrub with some mighty power. What About The Massage Element? If i didn’t explain properly this exfoliating face brush doesn’t just have bristles it has a whole other side to it, one that promises to massage your face and get the blood moving (i am guessing for proper cell turnover). I did like this element and it did sway me in to buying it (even though i couldn’t touch it) but, it isn’t something i would rave about. Yes it feels nice to massage in my moisturizer after cleansing my face but it doesn’t really do much for me and i find the bristles far more exciting. Because i don’t suffer from sensitive skin and love a good scrub, this soap and glory face brush is literally my new favorite thing ever. I like the medium to hard bristles, i love how easy it is to use and clean, i love how it doesn’t soak up all of my product and i also love how amazing my skin feels afterwards. I feel like the only downsides would be that it is a bit too harsh on really sensitive skin. The price is something i can overcome, especially considering how expensive other face brushes can get and as i mentioned before, i would happily buy it again. The massage element was a nice touch but not something i am going to go on about, the bristles is where it’s at for me. 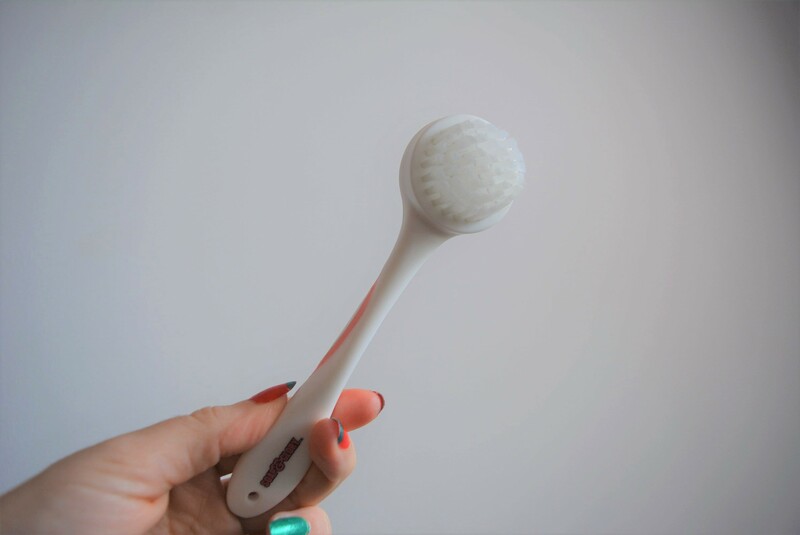 If you want soft, super clean and exfoliated skin i 100% recommend this facial brush but if you do have sensitive skin and don’t like firm bristles, it probably isn’t for you.
. Click here if you are in the EU or Click here if you in the US. Thank you so much for reading this review, have a lovely day and if you have any questions please just leave them in the comment section below!